Afghanistan’s first and only female Governor Habiba Sarabi among this year’s recipients of the Ramon Magsaysay award. The Board of Trustees of the Ramon Magsaysay Award Foundation (RMAF) on today (24 July 2013) announced that this year three individuals and two organizations from Afghanistan, Indonesia, Myanmar, Nepal and the Philippines will receive Asia’s premier prize, the Ramon Magsaysay Award. Established in 1957, the Ramon Magsaysay Award is Asia’s highest honor and is widely regarded as the region’s equivalent of the Nobel Prize. It celebrates the memory and leadership example of the third Philippine president, and is given every year to individuals or organizations in Asia who manifest the same sense of selfless service that ruled the life of the late and beloved Filipino leader. 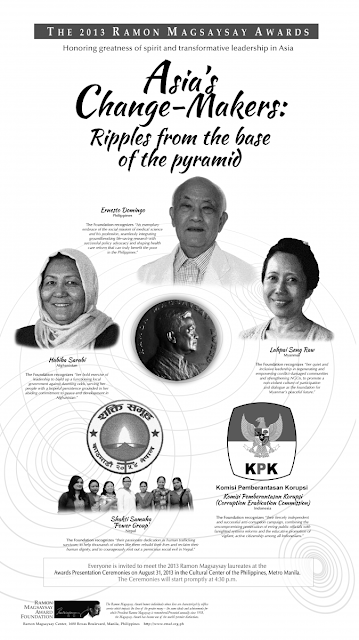 “The Magsaysay awardees of 2013,” says RMAF President Carmencita Abella, “are three remarkable individuals and two amazing organizations, all deeply involved in creating sustainable solutions to seemingly intransigent social problems in their respective societies, problems which are most damaging to the lives of those trapped in poverty or ignorance. These problems are manifest in seemingly very diverse and disparate issues--prolonged armed conflict, preventable disease and death, human trafficking and exploitation, corruption with impunity, weak governance and political instability--yet each of this year’s awardees is showing us that there are ways to build genuine success, one smart and persistent step at a time. Working selflessly in unpretentious yet powerful ways, they are showing us how commitment, competence and collaborative leadership can truly create ripples of change, even from the bottom of the pyramid. The five 2013 Magsaysay awardees join the community of 296 other Magsaysay laureates who have received Asia’s highest honor to date. This year’s Magsaysay Award winners will each receive a certificate, a medallion bearing the likeness of the late President, and a cash prize. They will be formally conferred the Magsaysay Award during formal Presentation Ceremonies to be held on Saturday, 31 August 2013 at the Cultural Center of the Philippines.